Most restaurant owners know in today’s world that being digital is critical. In fact 88% of people are influenced by reviews and online comments when it comes to making a decision on where they will eat. But what can you do besides post photos of your dishes? 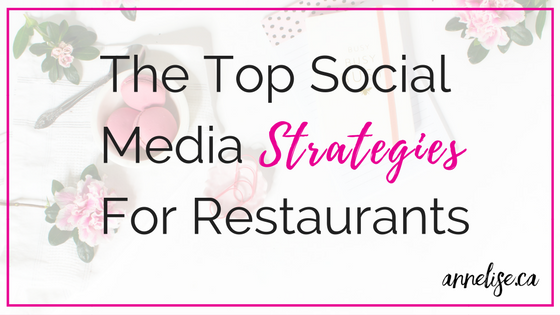 There are many different social media strategies for restaurants. 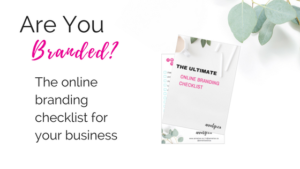 If you are wondering what you should be doing online if you are a restaurant, or any service based industry there are a few things that you can do to ensure your business is on the right path. All profiles should have streamlined branding, logos, photos and if possible match all handles to keep it simple. Matching handles also make it much easier when you want to advertise all your social media channels with one username. Add your menu to the page. If you have multiple locations, add all of them to your page, and you can even link them to each other. Create a book now button if your restaurant accepts online reservations. Add to your services tab. The services tab on Facebook allows you to add services such as catering, private parties or you could even add “great for kids” etc. Have your review tab easily available, encourage reviews, and of course respond to all reviews. 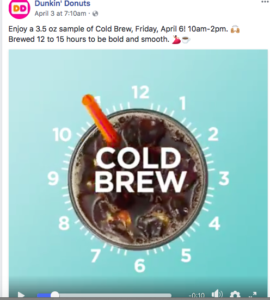 When posting about your happy hour specials or meal of the day you don’t need to advertise like you would in traditional print. Online viewers are trained to scan pass this type of content and it will not get engaged with. A simple photo that shows the type of mouthwatering food or drink you will be serving with a caption will get viewers stopping to take a peak. Other apps such as Boomerang and slow motion allow you to show the food in action, as well in an eye catching way. The restaurant industry has one of the most highly engaged group of consumers who will generate content about your business. Remember all those people sharing what they ate for breakfast, lunch and dinner? Let them post about you. Your customers can be great ambassadors of your brand. You can share these posts back to your company page. The #MyPieology hashtag is what is doing it for them. If you share a photo or video of you enjoying Pieology you can have the chance to be featured on their large social media following page. Its fantastic in the fact that their customers are creating content for them. It also solidifies credibility to the Pizzeria when others are willing to share with their friends and family. 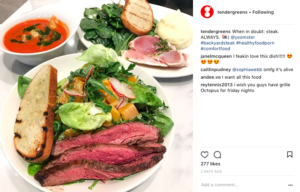 They have a complete Instagram page filled with user generated content just by using the hashtag #tendergreens encouraging all foodies, food lovers, and chefs to share their dishes with the hashtag for a chance to be featured on their page. Its the employees and entire support team that make the restaurant so take the time to highlight them! Have a weekly or monthly spotlight on one of your team members or have a weekly highlight reel of your staff. This is also a great way to boost some morale with your team. For example, taking a look at the chef behind those beautiful masterpieces of food is a great way to showcase your restaurant. Not everyone gets to see the back of the house staff on a daily basis and personalizing the experience by showing your hard working dishwasher can bring genuine personality and story telling to your restaurant, even in an online atmosphere. One of the number one sources that customers use to choose a restaurant is online reviews. Google, Facebook and Yelp are all great places to host your locations for reviews. Yes, of course negative Nancy is always going to show up complaining about anything, including the air, however it is more about how you respond to those reviews. 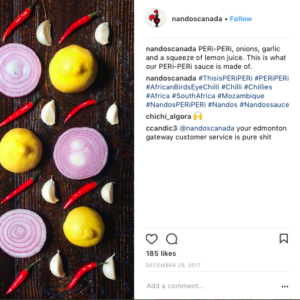 Speaking of reviews, Nandos really should respond to comments like this! Remember to ask. Not everyone thinks to post an online review about their visit, but it doesn’t mean they didn’t love their experience. Creating specalized offers and discounts that you send out to online followers is an excellent way to create engagement. Your going to want to listen to he entire episode if you can, but if you skip to the 47 minute mark the one point I want to touch on is the social media aspect using Instagram. What Gary does is search the location “Lexington Kentucky” on Instagram and he finds someone within the top 9 posts that has 2387 followers. You can instant message them and offer them a coupon for money off or a free meal. 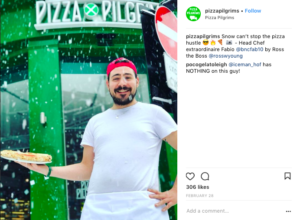 Once they post their meal, because of their profile and the likelyhood of them sharing their restaurant meals on Instagram is relatively high, they have now showcased their meal to over 2000 people locally. The only expense being the the food costs of that one meal. It’s not hard to know that video is necessary in almost all marketing. There is no exception when it comes to restaurants, in fact video generates 1200% more shares than text and images combined. Go Live before the rush and show whats happening in the front and the back of the house. You may even want to go Live during a big event, game or if you have made a change in your restaurant. But wait, what if there is nothing big going on at the restaurant? That’s ok, theres always some type of action happening and beleive it or not it will be interesting to viewers. Take them behind the scenes and see what your chef is up to. Go through a simple dinner plating to show exactly how they make a certain dish. 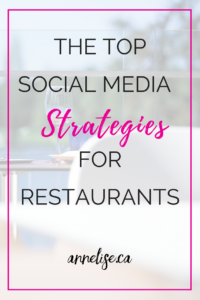 If you are interested in learning more about social media strategies for restaurants, cafes or any other service based industries feel free to contact me and I would be happy to answer your questions. Thank you so much glad you enjoyed.